Senior living communities must be proactive in building their offerings to appeal to potential residents and their families. 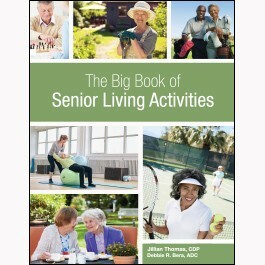 The Big Book of Senior Living Activities features over 100 activities facilities can use to offer a welcoming environment and ensure an engaged, social community. Authors Jillian Thomas, CDP, and Debbie R. Bera, ADC, provide strategies to ensure a sustainable, organic, and successful resident activities program. Staff will gain the knowledge to successfully manage activities while gaining leadership, employee, and resident buy-in. No matter the clinical condition or cognitive limitation, this book offers activities that suit each individual’s needs. Jillian Thomas is director of assisted living operations for Covenant Retirement Communities (CRC). In this position, she is responsible for the coordination and oversight of CRC’s assisted living and memory care programs within its 13 retirement communities nationwide. Thomas has more than 10 years of healthcare and management experience in the senior housing industry. She began her career as a certified nursing assistant and in 2005 became executive director for an 80-bed assisted living and memory care community in northern Illinois. She is a dementia practitioner and holds a certification in assisted living administration in Wisconsin as well as RCFE certification in California. Thomas is also a member of the Leading Age Illinois Assisted Living Cabinet and is certified as a support group facilitator for the Alzheimer’s Association. Debbie R. Bera, ADC, is the activity director at Portage County Health Care Center in Stevens Point, WI. She has over 30 years of experience in long-term care, including as a nursing assistant, activity assistant, and activity director. She holds Basic and Advanced Supervisory Certificates, and a Dementia Care Specialist certificate. She is a member of several healthcare associations based in the State of Wisconsin, and is president of the Wisconsin Representatives of Activity Professionals. She is also certified by the NAAP and serves as the association’s vice president in 2008.